​The Mountain View Coalition for Sustainable Planning is a group of local volunteers dedicated to making Mountain View as beautiful, economically healthy, transit, bicycle, and pedestrian accessible, and affordable as possible. MVCSP member interest and expertise covers areas such as housing, transportation, the environment, the economy, and beyond! MVCSP generally meets on the second Thursday of every month from 6:30-8:30 PM. The location varies. See "What's Hot" below and the Calendar for upcoming-meeting details. To get the latest MVCSP updates in your inbox, click here to subscribe to our announcement-only email list (about one message per week). The purpose of this Study Session is to receive Council direction related to a stacked-flat condominium project at 2645-2655 Fayette Drive, which received Gatekeeper authorization in December 2016 but has been subsequently revised by the applicant. 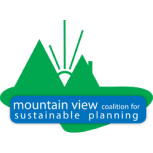 ​​​Thursday, May 9th, 6:30 PM: Mountain View Coalition for Sustainable Planning (MVCSP) general meeting, Deb's place (contact mvcsp.info@gmail.com if you need location details). ​For more about the above and other items, see NEWS AND UPDATES and CALENDAR. City of Mountain View City Planning Division Update: Page updated for April 2019. The Mountain View Transit Center Master Plan Final Report is now available online at www.MountainViewTransitCenter.com. The Final Report summarizes the roughly two-year, community-driven process to identify preferred concepts for the Castro Street grade separation and Transit Center. The Master Plan was approved by City Council in May 2017. Long-time MVCSP member Julie Lovins passed away Friday night, January 26th. An event in her honor is planned for February 11th starting 12:30 PM at City Hall, Council Chambers (2nd floor), 500 Castro Street. MVCSP comments on 555 East Evelyn project to EPC January 3, 2018. The City of Mountain View is hiring a full-time, benefited, limited-term “Environmental Sustainability Analyst.” For details, see https://www.calopps.org/mountain-view/job-17485961. The priority application deadline is Sunday, December 17th. New page on this web site added: Fiscal Year 2017-18 Advisory Body workplans. New page on this web site added: Fiscal Year 2017-18 City Budget. For most topics, you can click appropriate tabs at the top of any page. Others are included under the MORE tab.